As many of you know, Tuesday is Election Day. Voters will head to the polls across the country to choose many of our political leaders and make their voices heard on many important issues. 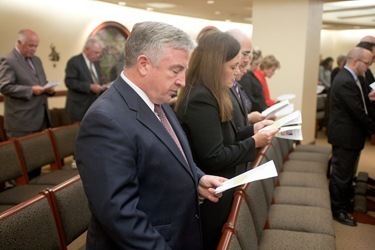 It is vital that Catholics realize the importance of participating in a democratic process, and the positions of the Church on family and the Gospel of Life need to be central in our decision for what is best for society. One of the greatest blessings of our American democracy is the opportunity it affords to its citizens to step up and share their vision of a better society. Even in these difficult social and economic times, we continue to strive for a community in which all can benefit, and from which no one is excluded. It was the same yearning for a better life for everyone that brought many of our ancestors to this country. So it is a deeply-rooted concern for the common good that has moved us throughout our history to participate in the election process. Our convictions about the importance of voting are bolstered by the innate sense of hope that has endowed this nation with such promise in good times and in bad. We go to the polls no matter the direction of the social and economic trends at the time. As Catholics we also are a people of hope. Hope is the Christian virtue that confirms our belief that we are never abandoned, and that we are always loved by God. We express these truths every time we extend our love to others as part of one human family. This same hope guides our civic involvement. well-founded reasons and high ideals into the democratic debate[. ]” Papal Address to the Pontifical Council for the Laity (May 21, 2010). Particularly for us as Catholics, voting is an exercise of reason inspired by faith. The Holy Father has thus observed: “Just as every economic decision has a moral consequence, so too in the political field, the ethical dimension of policy has far-reaching consequences that no government can afford to ignore[. 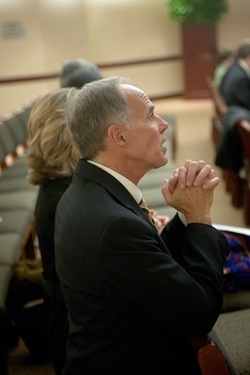 ]” “This is why,” he continued, “the world of reason and the world of faith—the world of secular rationality and the world of religious belief—need one another and should not be afraid to enter into a profound and ongoing dialogue, for the good of our civilization.” Papal Address at Westminster Hall, England, Sept. 17, 2010. Our participation as citizens in the electoral process allows us to propose our vision for this country and about our future as a democracy. Thus voting is above all an opportunity—an occasion for contributing our insights as Catholics to the civic discussion nationally and locally, thereby inspiring social change consistent with our country’s foundational values. Deciding which candidate in any particular race offers the best opportunity to take us in the right direction is not an easy task. Yet there is a measuring rod by which all electoral choices must be evaluated: will my vote enhance human dignity? Certain moral and social issues are fundamentally important, since human rights are at stake and must be protected to help democracy to flourish in a way that benefits every citizen. 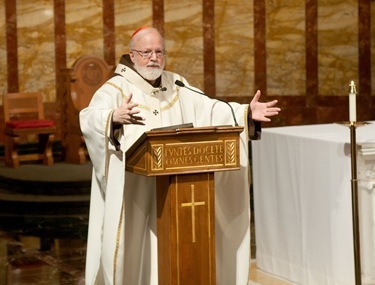 These include the defense of the sanctity of life, the family based on marriage between a man and a woman, religious freedom, and the well-being of the poor. As shifts in societal challenges are inevitable, it is also vital to determine from election to election which human rights face the greatest threat at the time of voting. The opportunity to vote is a blessing. Taking advantage of this opportunity is an expression of hope. Go to the polls on Election Day and, through your choices at the ballot, act on your vision of a better society. 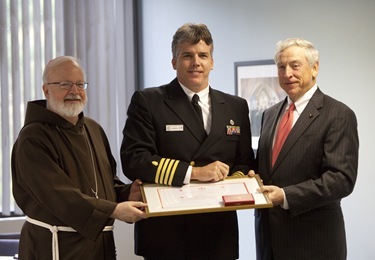 Last Thursday, I attended a luncheon for the Order of Malta. The emcee was Jim O’Connor. 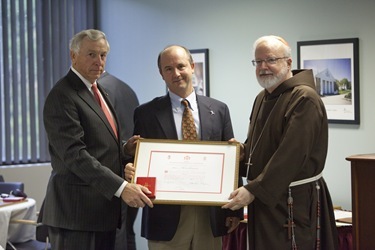 The Order of Malta recognized various people who helped in relief efforts after the earthquake in Haiti this year, and who particularly aided their hospital, Sacré Coeur in Milot. 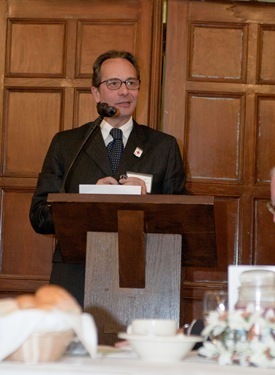 They honored the head of nursing, Michelle Fey; the head of the emergency medicine, Dr. Mark Perlmutter; and the Caritas Christi Health Care CEO Dr. Ralph de la Torre. They also honored Coast Guard Commander James Spotts, Navy Captain Andrew Johnson and Navy Officer Michael Holmes for their role in supplying food and helicopter transportation for the injured. It was a very touching luncheon. That afternoon, I had a visit from Father Paul Hurley, brother-in-law of Kevin Kiley, who works at our Pastoral Center. Father Hurley is an Army chaplain and he is back from overseas, and will be returning to deployment after a short visit home. 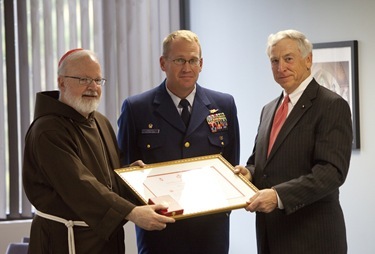 He talked about the difficulties chaplains experience and the shortage of priests in the military. 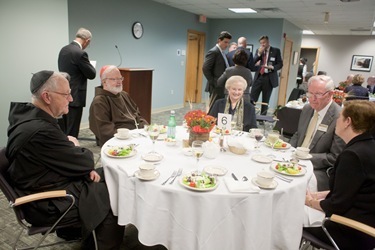 That evening, we hosted the Boston chapter of Legatus, an organization of Catholic business professionals, for a Mass and dinner here at the Pastoral Center. 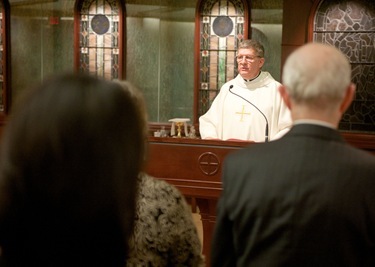 Father Bob O’Grady, the Boston chapter’s chaplain, was the homilist at the Mass. Following the Mass, there was a dinner. 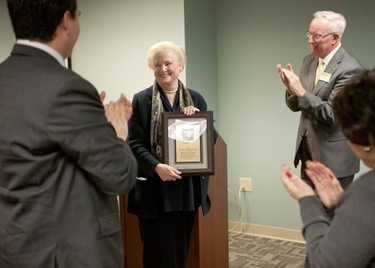 During the evening, Mary Ann Glendon was given the Courage in the Marketplace Award. She gave a very nice talk on faithful witness in the public sphere. 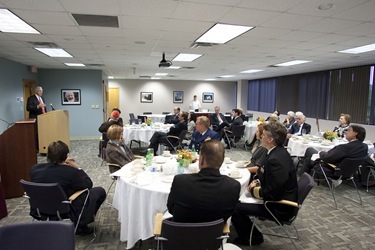 I spoke at the dinner and afterwards took questions from attendees. 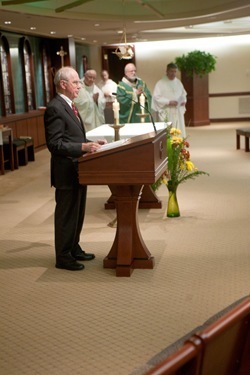 On Friday, I went to St. Agnes Church in Arlington for a Mass to celebrate the 50th anniversary of Arlington Catholic. 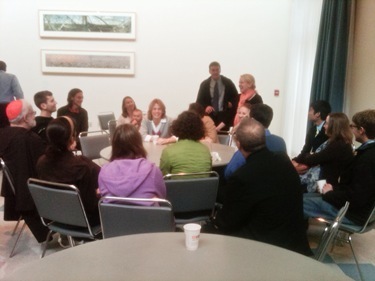 I also had lunch there with the principal, the staff and their pastor, Father Brian Flatley. It was a beautiful celebration. 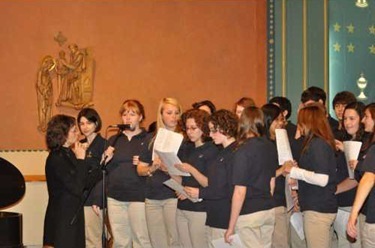 The students sang so well! 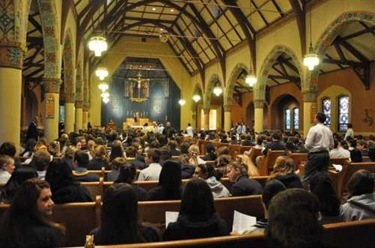 It shows what Catholic schools can accomplish for the religious formation of our young people. 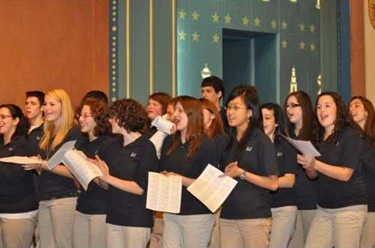 The school is thriving, with over 800 students in the high school and more than 300 students in the grade school. 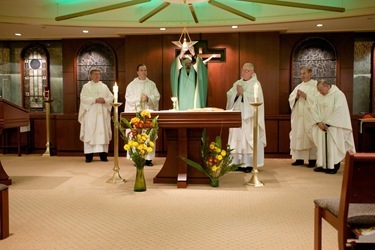 That evening, we had the annual White Mass and dinner for the Guild of St. Luke, the Catholic doctors group in the archdiocese. 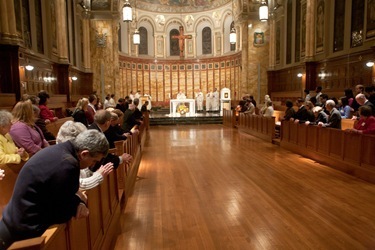 The Mass and dinner were at St. John’s Seminary. 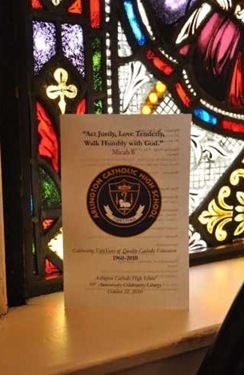 This year they are celebrating their 100th anniversary, and the evening kicked off their centennial year. 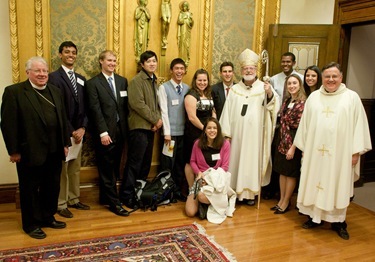 At the Mass there were a number of medical students from Harvard and other universities who joined us and the doctors. 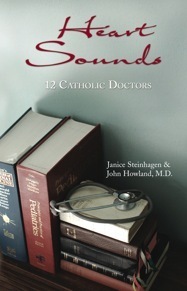 Dr. E. Joanne Angelo gave me a copy of a book she contributed to, Heart Sounds: 12 Catholic Doctors. It tells some wonderful stories of Catholic physicians keep – and grow in — their faith in an atmosphere which can at time be very hostile to the Culture of Life and Catholic moral values. 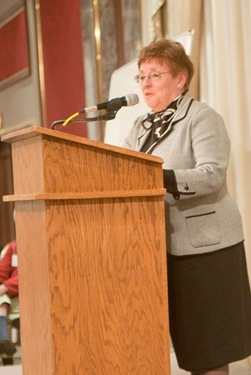 Dr. Helen Jackson is president of the St. Luke’s Guild, and she was the emcee for the evening. 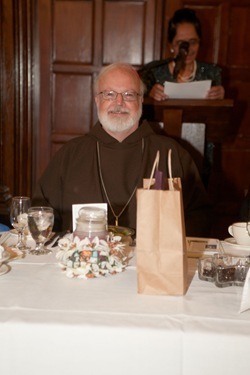 She gave me a box of chocolates for my 40th anniversary as a priest. It was very thoughtful. She also introduced Dr. Alessandro di Francisis, who is a very fascinating figure. He is a pediatrician from the University of Naples, one of the oldest universities in Europe. For the last year, he has been a physician at Lourdes to evaluate the cases of miraculous cures that are presented. He is a very articulate speaker and gave a very beautiful talk about his work there and his experience with extraordinary people and events with which he constantly comes into contact. 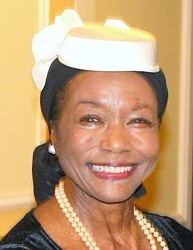 Also at the dinner we remembered Dr. Mildred Jefferson, who passed away a week before. 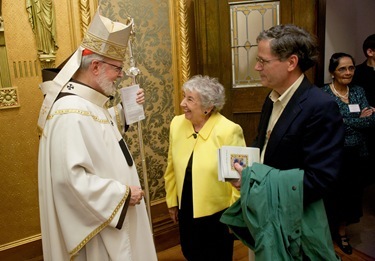 She was such a valiant defender of the Gospel of Life and was so active in the pro-life movement. Her presence will be sorely missed, but we know her legacy will live on and her example will hopefully inspire other Catholic physicians to become involved actively in the pro-life movement. In my reflection with the physicians, I asked them to become involved in these issues, particularly the life issues and the conscience clauses to defend the religious rights of health workers. Their voices are very, very important. 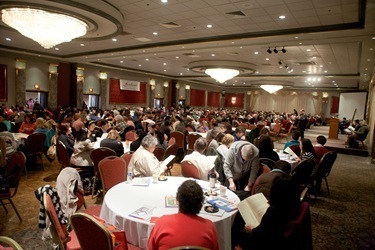 Even though I was not able to be present at this year’s Catechetical Congress, which was held Saturday at The Lantana in Randolph, I wanted to take a moment to express my gratitude to all who helped put on the event, as well as the hundreds of parish catechists, directors of religious education, youth ministers, and other staff who attended. Your presence and your desire to deepen your knowledge and faith, and lead our young people closer to Christ, is extremely commendable. 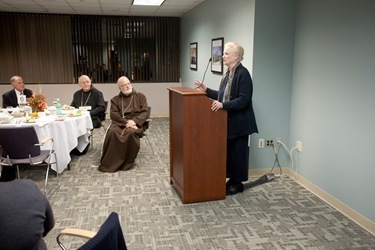 I am especially grateful to our Secretary of Faith Formation and Evangelization Janet Benestad, Susan Abbott, Susan Kay and Pilar Latorre for organizing this event. 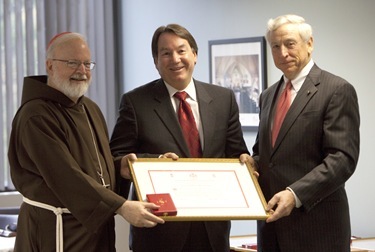 I also want to thank Bishop Peter Uglietto, who attended in my place. 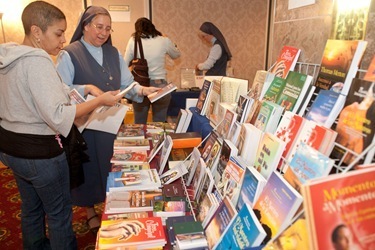 Each year, the archdiocesan Catechetical Congress is a wonderful event that brings together many people from all our ethnic groups, particularly our Spanish-speaking community. 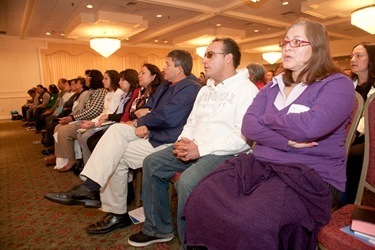 The event has two tracks — English and Spanish-language programs. They also recognize two outstanding leaders in parish religious education and catechesis at the conference with the Sister Marion O’Connor Award for Excellence in Catechetical Leadership. 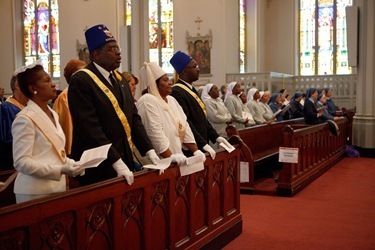 This year’s winners were Diahne Goodwin, the DRE at St. Catherine of Alexandria Parish in Westford, and Sister Thomasine Twomey, who received the award posthumously. 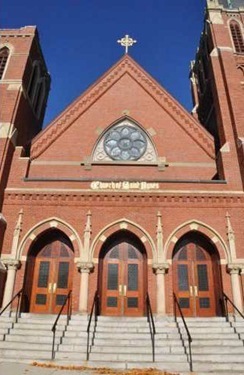 She was a catechist at St. Patrick Parish in Roxbury. Two women from the parish accepted the award on her behalf. 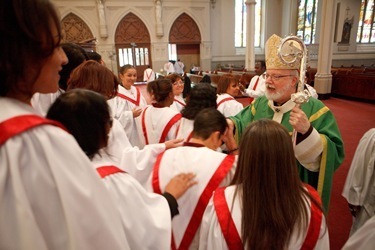 That day I celebrated the Mass of candidacy for our permanent diaconate program. 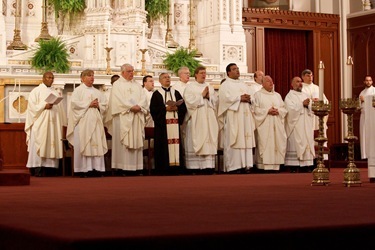 Deacons Dan Burns and Patrick Guerrini, of our diaconate office, were on the altar with me. It was at St. Bernard Church, where Father Frank Silva is pastor. The parishioners were very gracious. 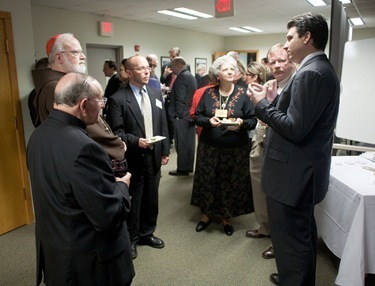 There was a lovely reception that the parish organized for the deacon candidates and their families afterwards. 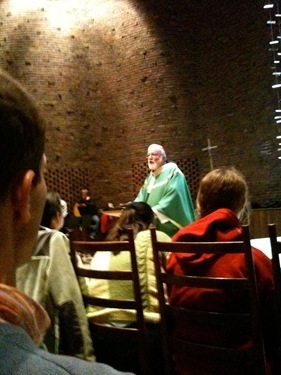 On Sunday, I went to MIT, as I occasionally do, where I was the main celebrant at a Mass for the students there. There was a wonderful standing-room only crowd which extended out the door and down the corridor. The music is always extraordinary. They had many musicians playing the cello and other instruments. Afterwards I attended their coffee hour and had a chance to visit with our FOCUS team there, as well as other people from the MIT community. 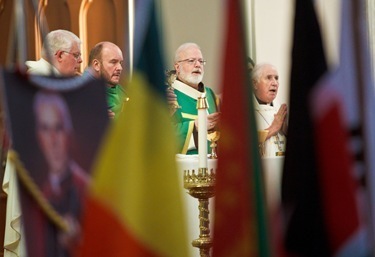 In the afternoon we had our celebration of World Mission Sunday at the cathedral. 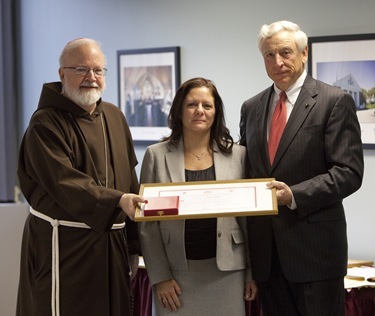 We are also grateful to Father Rodney Copp, Maureen Heil, and the staff at our Propagation of the Faith office for organizing this. Concelebrating with us was Bishop Donald Pelletier. 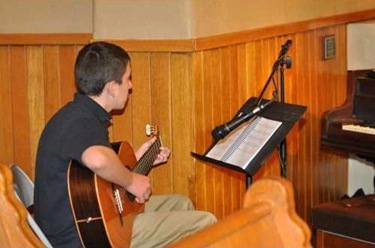 He is originally from Boston but has spent over 50 years with the LaSalette Missionaries in Madagascar. He recently retired as bishop of the Diocese of Morondava there and is home visiting for a time. 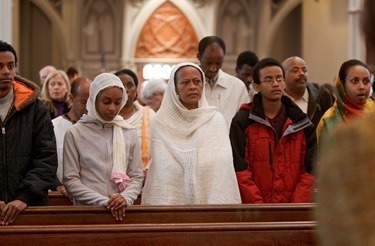 We were pleased that he and a number of priests from the ethnic apostolates were able to join us for the Mass. 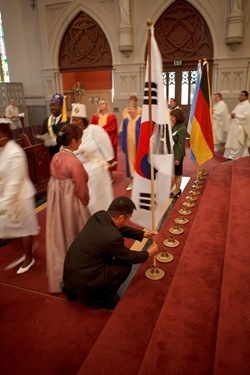 There were many different choirs who provided music for the Mass, including the Cape Verdean choir from St. Edith Stein Parish in Brockton, the choir from St. Peter’s in Boston, which is a Lithuanian parish, the Korean Community Catholic Choir of Boston and the Caritas and Unitas Choirs. 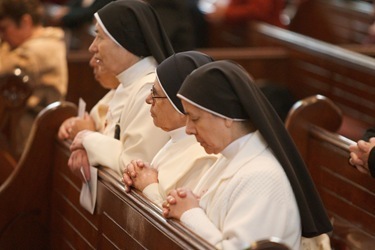 There were also many religious sisters there. 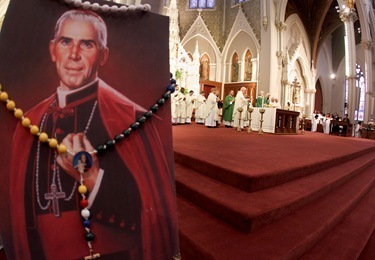 In my homily, I commented on the fact that when we had our bicentennial the Archbishop of Bordeaux came, and people from his diocese sent me copies of the letters in beautiful French that Bishop Fenwick had written to the Propagation of the Faith asking for help for the Church of Boston. 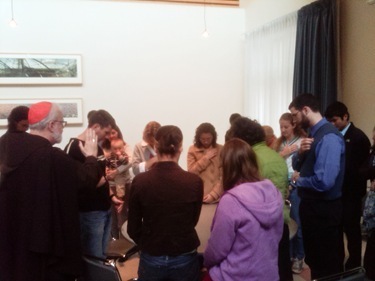 French Catholics, through the Propagation of the Faith, were so generous in supporting our Church here. 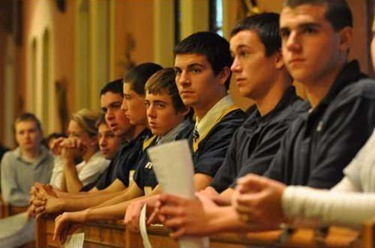 For the first century of our diocese, we were under the Propagation of the Faith. I said Boston has become a mission-minded place. Two founders of Maryknoll were from here, and Cardinal Cushing had such a love for the Propagation of the Faith and sent over 300 priests to the St. James Society. 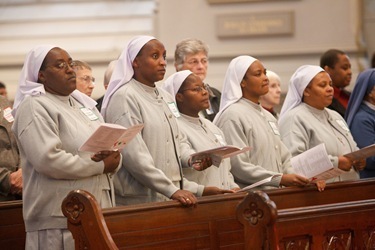 I also mentioned that when I joined the Capuchins I thought I might go to work in our mission in Papua New Guinea, where classmates of mine have been working for the last 40 years. 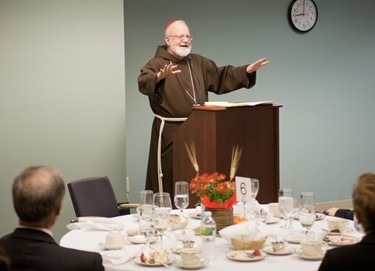 Just last week, one of our Capuchin Friars, Father Bill Fey, was ordained a bishop for the Diocese of Kimbe there. We have some beautiful YouTube footage of the ceremony, which is quite different than what we’re used to here in Boston, but I want to share it with everybody to appreciate the joy and enthusiasm of Catholics in Papua New Guinea. 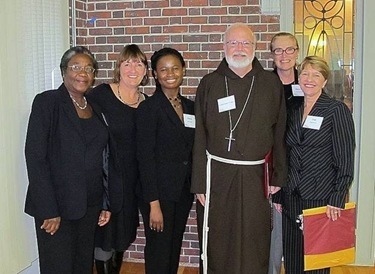 On Wednesday I attended a meeting of the Regis College Haiti Project Advisory Board. Regis first became connected to nursing education programs in Haiti through the assistance of Partners in Health, established here in the Boston area by Dr. Paul Farmer more than twenty years ago. Dr. Mary Jane England, President of the College, and Dr. Toni Hays, Dean of the School of Nursing and Health Professions, are leading Regis’ efforts to expand the college’s collaboration with Haiti’s Ministry of Health through the International Nurse Faculty Partnership Initiative (INFPI). Having asked the nursing community in Haiti what they need, the program’s goal is to provide “upward mobility” training for nursing personnel with a particular focus on developing faculty for the nursing schools. Through my work with Catholic Relief Services and the U.S. Bishops Conference Subcommittee for Haiti, I hope to be able to be help with this important initiative. 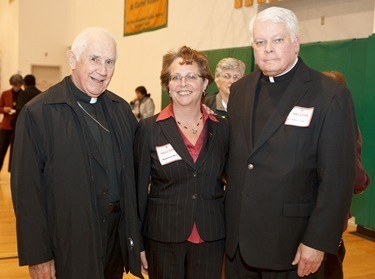 We are blessed by the commitment that Regis College has made to guide this project forward. What a great idea to open your week to us in words and photos! We can see the flowering of the Church in many ways, and that inspires hope and confidence in the future. Please keep the doors of the Church open with your blog. Could you please give me a little help here. 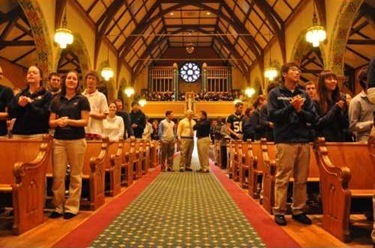 With the different opinions being voices by the leaders of our Church, I am a confused Catholic with little clear guidance on how to consider the relative importance of “the sanctity of life”, “marriage between a man and a woman”, “religious freedom”, and the “well-being of the poor” when deciding how to cast my vote. I have read that the threats to “the sanctity of life” are an “intrinsic evil” that override other moral considerations. Other bishops and theologians say that all of there moral issues must be considered in deciding how to cast my vote. So where does a Catholic go to get a clear statement of the relative importance of significant moral issues when deciding how to vote? At this point, I am not sure if the information is available or if I am just not looking in the right places.